In Europe, the incense came from the East. The most ancient perfumers were probably Egyptians. Incense accompanied them not only in life but also after death. Now, thanks to the dedication of our contemporaries, exotic Eastern teachings and medicine, incense is experiencing a new period of popularity.Incense there are different types of incense sticks based on bamboo, wood chips, coal sticks, unbonded incense sticks, cones, barrels, powders, clay incense and liquid essential oils. How to use perfumes correctly to get a favorable result, and not a headache or allergies. • Aroma lamp, warm water and a candle. 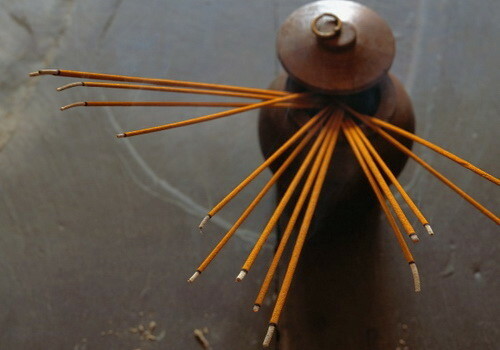 The most common form of incense is incense sticks on bamboo base. These sticks are mainly manufactured in China or India. They are made with the use of bamboo straws, which is immersed first in the aromatic mixture, and then in the aromatic oil. The aromatic compound may include shavings of the fragrant trees (sandalwood, juniper, etc. ), crushed herbs and essential oils. Buying a stick, be careful. As for the manufacture of their cheaper variants, often use synthetic essential oils, which give nothing except a strong smell. To burn incense sticks, set fire to her and gently blow out to smouldering without flame. Better to buy a stand for the sticks, as when burned, they fall to the ground in ashes. Another type of incense is the coal sticks or cones. The aroma of these sticks is not mixed with the scent of burning bamboo, but they are more fragile and their application requires special supports. There are also incensewhich is called "plasticine". Binder base for herbs and essential oils in these spicesx is ghee, honey, or resin of aromatic trees. Among these rarer incense is not natural, and to attach them to any surface. In India they are popular in the markets and streets. Cones and barrels are pressed herbs and shavings of fragrant trees. It is the most natural and comfortable type of incense. Stand under them may be any flat candle holder or bowl that can withstand heat. The ashes from such spice does not fly, but remains on the stand. Incense in the form of resins (frankincense, myrrh etc.) or bulk ground herbs require special incense burners. Incense burners, most often, represent the bowl on a low sheath (metal, stone or clay). Sometimes they are closed with a lid with holes, and sometimes they are suspended (e.g., spoon). To burn solid or granular incense, need to take a censer, fill it sand or coarse salt (half volume), on the sand to put a special carbon tablet which is ignited. Coal tablets, more often, processed nitrate to charcoal easy light up from the offered matches. Otherwise, the coal is sprayed with alcohol and then set on fire. Incense in a censer is thrown on a hot coal. In this case it is better not to overdo it with the perfume of the same incense only need a couple of seeds. Herbs should be crushed into a powdery state. If the grass is a little thick then it is better to grind in a mortar. In addition, as liquid incense used essential oils of herbs and trees. We can not do without lamps. Now, however, they are produced in large numbers, for every taste and budget. In a container of fragrance lamp pour a little warm water and drip a few drops of essential oil. Remains to burn the tea light, which is located under the bowl of the burner. Always carefully read the composition of the incense. If it is composed of natural essential oils or herbs replaced by a synthesized aroma, this perfume will not give any medical or ritual effect. Be careful with the spices, which have a carbon or bamboo based. These incense sticks can in some people cause headaches and allergies. If you use incense with a charcoal tablet, charcoal kindle better near an open window or under the window. For the first time coal gives a lot of black, smelly smoke, which disappears when heated pills. In Nepal, Tibet and Bhutan, produce loose incense, which do not need a hot coal for burning. This herbal powder is just poured on a fireproof surface a slide or track, and then set on fire. Please use caution when using unfamiliar spices. Even if you or your loved ones no allergic reactions that may result in individual intolerance of this flavor or herbs. With the advent of the popularity of the ancient teachings of Feng Shui and other attributes of the Eastern culture, more and more people began to use scented sticks. Some use incense for magical rites, others as a flavoring air. 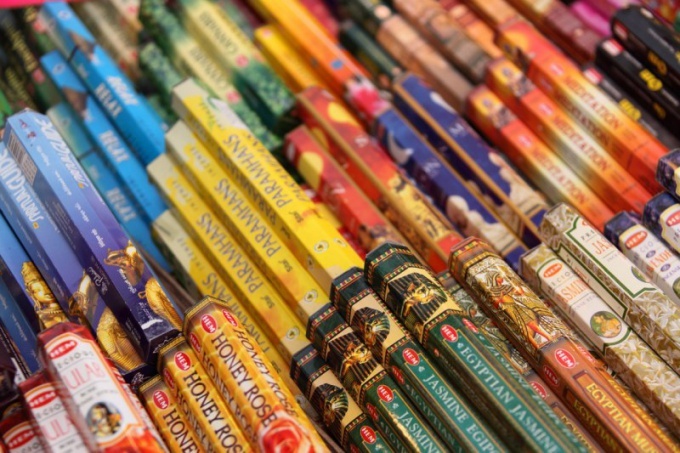 Incense sticks have antiproteinase, antibacterial and antifungal properties. Therefore, in some countries, where high humidity, incense fumigate the premises to protect yourself and your family from viral and fungal diseases. And in the middle ages, when the world plague raged, incited aromatic bonfires of pine trees. They gave acrid smoke, which spread throughout the city. Modern inhabitants of the planet, also will not damage prevention of the disease through incense. For example, as a disinfectant you can light candles with the scent of lavender, pine, cedar or eucalyptus. It is also believed that incense sticks affect the human nervous system and help to cope with certain diseases. So, the aroma of cinnamon, rosemary, patchouli enhance memory, give courage, inspire optimism. Rose, sandalwood, lilac, Lily, lavender, Jasmine to help relax after a hard day, relieve stress. Lemon and eucalyptus contribute to the rapid cure colds, relieve headaches, strengthen the immune system. Want to protect yourself from negative influences, evil eye or damage, okuribito your house sticks with the scent of frankincense, Mandarin, Lotus, juniper. In addition, incense can rid your home of insects. If you fill the room with scent of peppermint, eucalyptus or lemon, will disappear mosquitoes and moths. Scientific studies have shown that frequent use of incense contribute to the development of lung cancer. It should be noted that this does not apply to those people who smokes in the premises with the sticks not more than 2 times a week. Candles with a strong smell can cause headaches or allergic reactions. Therefore, the choice of fragrance should be approached with great responsibility. Examine the value of scents and their effect on the body. If the smell of equivale causing you discomfort, it should be abandoned. Harmful to health, cheap candles of dubious quality. To purchase perfumes is recommended only in specialized stores responsible for the quality of the product. Choosing curiatii, check to see whether exudes a pungent smell through the packaging – this product is better not to buy. Quality sticks must not consist of synthetic components. Otherwise they will cause irreparable harm to the health. You can't light multiple sticks with different odors. Otherwise the aromatherapy will not give positive results. Also, do not fumigate unventilated premises. By following some simple rules for the use of incense, you can be sure that any harm they inflict. But envelop a pleasant aroma and will give a lot of positive emotions.